Our review of the invention that promises to prevent that next inevitable coffee spill. Here’s something to think about: spills cause more damage to laptops than anything else. In fact, tech repair specialist Sewelltech estimates that spills account for 60% of laptop damage. Even more disturbing, nothing else comes close to being as destructive to such as expensive workplace resource and the invaluable data that they hold than a simple spill. And it’s not just laptops that stand to be destroyed. Many valuable documents have met an unfortunate end due to nothing more than a simple spill. So what can employers do to mitigate the risk of workplace spills? Wouldn’t it be great to prevent the damage caused to laptops and other important documents in the workplace by the risk associated with the omnipresent coffee mug? In ideal an ideal world, company owners would never have to swallow losses caused by this seemingly unavoidable fact of nature ever again. In reality, most business owners simply resign themselves to the inevitable hits to their bottom line associated with workplace spills. Unfortunately, what many employers and business owners don’t realize is that there actually is a solution out there that will actually stop spills before they happen and it comes in the form of an unspillable mug. There are few people out there who haven’t experienced the common annoyance of spilling their coffee. The thing is that when it comes to the workplace, the risk of spills becomes especially ominous. In just one fell swoop, important documents can be destroyed and expensive office material including laptops can be rendered unusable, not to mention the risk of destroyed data. Until recently, most employers have just assumed that this is an unavoidable risk. After all, a workplace isn’t a workplace without coffee or some other delicious hot beverage, and mugs tip. At least that was the assumption until Mighty Mug came onto the scene. Here’s the thing that is truly remarkable about this company. The Mighty Mug was designed with a seemingly impossible goal in mind. The makers of Mighty Mug wanted to actually stop spills before they could happen. So how on earth can a mug actually do this? Read on to find out. So What Exactly is Mighty Mug? On the outside, Mighty Mug looks like a sleek and stylish office mug and nothing more, but as we all know, appearances can be deceiving. Despite its attractive and tasteful design there is a lot more to this groundbreaking product that meets the eye. Mighty Mug is the only mug that is resistant to being accidentally knocked over. This simple looking mug actually features groundbreaking patented technology that allows it to be spill resistant. So how did Mighty Mug come into being? When the creators of Mighty Mugs coffee spilled and ruined had their entire computer with just one fell swoop, they decided rather than cry over spilled milk, so to speak, they were going to do something about it. Thus they set out to create the ultimate solution to a seemingly impossible problem. They decided to stop spills from happening altogether. How would they do this you ask? By creating a mug that couldn’t be spilled. After three years of toiling and experimenting, Mighty Mug finally came into being and revolutionized workplaces everywhere. From its modest beginnings where a small team of mechanical engineers and industrial designers fully committed to dedicating themselves to providing an innovative solution to a worldwide problem, to becoming an overnight sensation that is now marketed in over 32 countries Mighty Mug really is the little mug that changed the world. It is not surprising that Mighty Mug is actually the most widely talked about drinkware product in history. This mug literally solved what most assumed was an unsolvable problem. Talk about groundbreaking. So how does it all work? The answer is patented Smartgrip Technology. Smartgrip Technology is a patented system that means that office mishaps caused by accidental mug knock-overs are a thing of the past. It works by creating an airtight seal between the bottom of the mug and desk or surface that the mug is placed onto. This seal is so airtight that it can resist the force of any knocks or bumps that are not intended. The result? A literally untippable mug. So Why Isn’t Mighty Mug Difficult to Pick Up? Astonishingly enough, Mighty Mug is effortless to pick up but will stick firm to surfaces knocked. So how is this even possible? Well, thanks to Mighty Mug’s innovative design that relies on the power of physics to solve a big problem, Mighty Mug can easily be lifted straight up and down but will cling stubbornly when bumped from the side. Genius! When employees attach their name to Mighty Mug branded they are not only enabling an easy way to protect their physical assets in the workplace but also implicitly spreading the word that they are aligned with forward-thinking brands and products. This is exactly the type of message that you want to be putting out not only to members of your team but to all the people that are exposed to the brand via your employees. The thing is that custom Mighty Mugs are not only innovative but also incredibly practical. In fact, Mighty Mug Go can easily end up anywhere, from a packed sporting event to the grocery store to social gathers. And each one of these occasions is an easy way to gain free brand exposure. Most people have probably heard the term BPA tossed around a lot, but what exactly are BPAs? BPA stands for Bisphenol A, which might sound like something out of a science fiction novel but is actually a very real compound that has been used commonly in plastics since the 1960s. It can be commonly found in plastics used to store food and drinks like Tupperware containers, baby bottles, and office mugs. It has been linked with negative health effects on the brain and other organs. Unlike many plastic products out there, the Mighty Mug brand is completely BPA free. When employers corporate gifts are custom Mighty Mugs, employees can take your brand on the road. It is designed to fit easily into car cups but unlike standard coffee cups, the Mighty Mug won’t be easily knocked over by a bump. Mighty Mug is completely dishwasher safe which means no hassle cleaning for easy everyday use. No need to worry about removing or cleaning around any delicate or removable parts, just toss it in the dishwasher and the Mighty Cup it is ready to use again the next day. One of the best things about the Smartgrip technology that powers Mighty Mug’s innovative spill safe system is its simplicity. An operating manual is not required and there are no buttons to push or switches to flick. This means that employers don’t have to worry about teaching their team about using the product or fielding questions because there is nothing to know or learn before using Mighty Mug. Employees just pick it up and it lifts effortlessly, and yet won’t fall down when it is bumped from the side. It sounds magical, but this smart technology is really just designed with usability in mind. 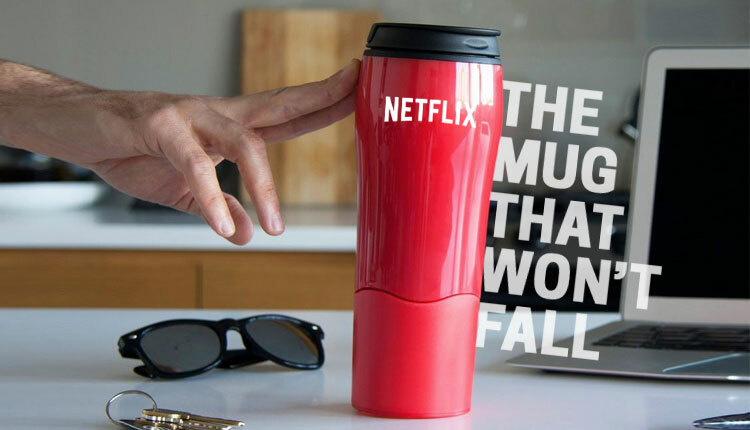 Just when you thought a mug couldn’t possibly do more than prevent spills before they actually happen, along comes the Mighty Mug Go version of Mighty Mug that is designed to be completely leak proof. That’s right, you can actually tip this mug upside down without so much as the tiniest drop escaping. This means that your employees can feel confident about throwing it in their purses, using it in their cars, and taking your brand’s logo to go. It is rare to find a company that is so dedicated to innovation as Mighty Mug. This is why it is no surprise that Mighty Mug has taken the world by storm. There are few people who would say no to a spill proof mug, and this is why promotional Mighty Mugs continues to exceed expectations and delight it’s devoted customer base. If you would like an easy way to protect your workplace from spills while associating your brand’s Logo with the technological leaders behind the development of Mighty Mug, you have come to the right place. Get in touch with us and let us know how we can team the perfect branded image with practical scientific wonder that is Mighty Mug.